So today, when glancing at the plant offerings on flats outside my local grocery store I stopped and took notice of the lovely cell packs of lettuce and thought: I have an empty windowsill, so why not put the hypothesis to the test? So for $4, I got four sets of three small cell-packs of lettuce (red and green leaf). If, like me, you buy the bagged, prewashed salad greens, you know that it’s quite common to pay just about that much for one 10-ounce bag… The thought of a continual crop for the same price is too seductive to resist. Of course, the care tags don’t give you much information, so this will have to fall firmly into the learn-as-you-go category. My windowsill has a southern exposure, so we’ll start with good light and regular watering and feel our way forward from there. But, I’m open to any tips fellow gardeners have to offer, so if you’ve grown lettuce successfully on a windowsill, let me know. Meanwhile, I’m thinking of one of my favorite salads: mixed lettuce, red seedless grapes, crumbled blue cheese, walnut pieces and raspberry vinagrette. And once my heirloom tomatoes are ready to harvest, the creative possibilities grow exponentially. I’m curious to see how this works out. My southern windowsill will be free once all my seedlings are transplanted outdoors. I’m considering growing leafy greens there for the rest of the year. Wow! Lunch at your house every day!! curious as well to see you grow lettuce. It looks like you’ve got cut and come again varieties which would be ideal. Have no experience of windowsill growing but I do find lettuce surprisingly tough and able to recover from a little wilt. What seedlings have you planted for your rooftop garden? Oooh! See, I’ve learned something already: “cut and come again”! I’ll remember that. Thanks for the tip! We’ll have to have a sampling party and have people bring their homegrown tomatoes to mix with the lettuce! How is your lettuce doing? 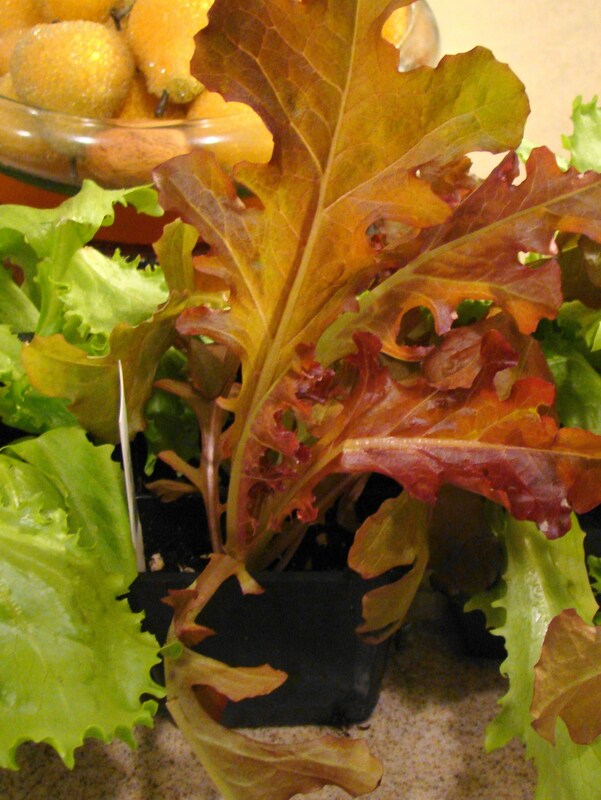 I never had luck growing lettuce in containers, or in the ground – it never grew, or the rabbits got them before it did, so I’m interested in hearing how yours is. My lettuce is struggling right now. I still have hope that it’ll adjust and thrive. I’ll do a post with a thorough update later. Thanks Avis! I’m looking forward to it.